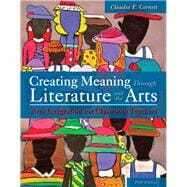 The most comprehensive text on arts integration in the market, this bestseller redefines literacy in light of the 21st century need for multiple literacies. It provides an overview of academically linked research in five arts areas: literary arts, visual art, drama, dance, and music, and is intended as a complete introduction to how to meaningfully use the arts as teaching tools on a daily basis in every curricular area. Organized around WHAT, WHY and HOW questions, Creating Meaning through Literature and the Arts, 5/e tells the story of how arts integration (AI) has grown so much in a few decades using the story of hundreds of arts-based schools–old and new, public, magnet, and charter, today’s. Each AI school story draws upon cutting edge research, evolving state standards, and constructivist beliefs to transform teaching and learning. The Enhanced Pearson eText features video resources. Claudia Cornett is a Professor Emerita at Wittenberg University. During her twenty-four year tenure at Wittenberg, she taught graduate and undergraduate courses in all aspects of literacy, children’s literature, and arts integration. She also directed the Education Department’s Reading Center. In recognition of her work, the Wittenberg’s Alumni Association honored her with the Distinguished Teaching Award. Before moving to the college level, Claudia taught grades 1–8, served a reading specialist, and earned a PhD in Curriculum and Instruction from Miami University. Claudia has written numerous books and articles about how and why the arts should be considered integral teaching and learning tools, and has publications in the fields of bibliotherapy, the strategic use of humor, and different components of literacy. In the latter category, her most recent book is entitled Comprehension First: Inquiry into Big Ideas and Important Questions (Holcomb Hathaway). In addition to writing, Claudia regularly does keynote speeches and conducts professional development for educators throughout the United States, Europe, and Canada. She has also been involved as a writer and worked on camera in various educational television productions including Sounds Abound (a series on early literacy), and Art Chat, which features interviews with artists in their studios. Additionally, she has done costumed interpretation in the role of Harriet Beecher Stowe and serves as a docent for two house museums: Glendower Mansion (Ohio) and the John Mark Verdier House (South Carolina). Currently, Claudia’s professional work focuses on addressing literacy issues using an arts-infused teaching model. She has also just completed a novel set in the Low Country of South Carolina, where she lives with her husband, a retired school superintendent. She can be reached at ccornett@wittenberg.edu.